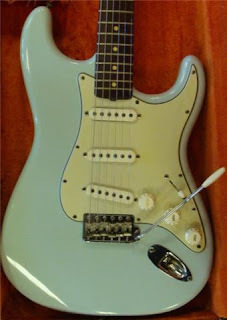 Here's an eBay listing for a 1964 Fender Stratocaster, in Sonic Blue no less. (Item #: 180416686465). The seller is the very reputable Norm's Rare Guitars of Tarzana, CA. This Strat used to be owned by Bon Jovi guitarist Richie Sambora who purchased it a few years ago from Norm's and recently traded it in for a 1954 model. Apparently, Sambora modified this particular guitar with a 5-way switch, replacing the stock 3-way, which means he actually bought it to play it -- always a good thing. I wonder if he tours with his vintage guitars. Looks like Norm has lots of cool guitars listed at eBay. He's been in the gear biz for a very very long time! I wouldnt dare to trade a 64 wth condition like that wth a 54 strat..maybe i just buy the 54 straight away! I know what you mean. I'm guessing the '54 is in as good a shape as the '64. Or better.